The Pintail Duck is a slim-bodied, long-necked bird that has a sharply pointed tail in contrast to the more common rounded one. The male has gray feet, a gray to grayish-blue bill and a white breast. The head is brown or greenish with a trailing edge. There is a bronze-green speculum. Females are mostly brown. They are 20 to 29 inches long and weigh 2 to 3.5 pounds. The Pintail Duck's range is northern Eurasia and the Americas. 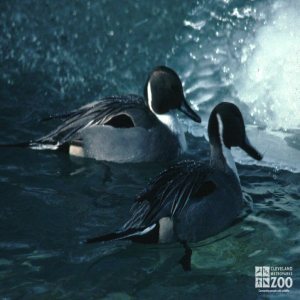 Pintail ducks inhabit fresh and salt water marshes and shallow fresh water lakes. Pintails move in large flocks, and banded birds have been recorded to fly 2,000 miles in migration. They are considered to be good eating. Very wary, they are crepuscular and nocturnal and they freely associate with other species. Their extra long neck allows them to feed in deeper water than most other dabbling ducks can exploit. The Pintail female is adept at feigning injury to protect her young. Only the female incubates the eggs. The nest is loosely constructed from dry vegetation and lined with down and feathers. It is less concealed than the nest of most ducks. The downy young are dark above and whitish below. They fledge in 6 weeks but are attended during that time by the female in addition to finding their own food. The male may be present in the early fledging stages.